Countdown To Christmas three designs stitched on the popular 14ct Aida Banded Ornaments with Christmas trim. Stitch counts 35w x 35h. Happy Fall Truck stitch count 112w x 109h, approximately 8" x 7 3/4" on 14ct. Halloween Ornaments two designs on prefinished Halloween ornaments. Stitch counts 29w x 31h and 30w x 25h. Cat Jack Pillow stitch count 77w x 77h, approximately 5 1/2" x 5 1/2" on 14ct. Come in for a Spell stitch count 98w x 93h, approximately 7" x 6 3/4" on 14ct. Rustic Winter Welcome stitch count 55w x 143h, approximately 4" x 10 1/4" on 14ct. Christmas Dove stitch count 161w x 119h, approximately 11 1/2" x 18 1/2" on 14ct. 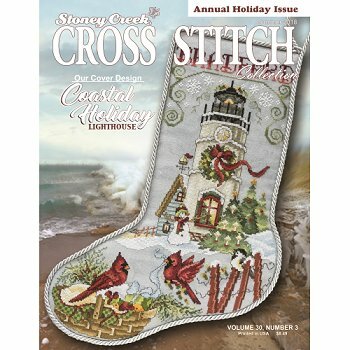 Coastal Holiday Lighthouse Stocking stitch count 153w x 216h, approximately 11" x 15 1/2" on 14ct. Halloween Cube & Ornaments four designs. Stitch counts 35w x 42h, approximately 2 1/2" x 3" on 14ct. All Hearts stitch count 66w x 156h, approximately 4 3/4" x 11 1/4" on 14ct. Think Outside stitch count 56w x 84h, approximately 4" x 6" on 14ct. Sand Donastions stitch count 112w x 51h, approximately 8" x 3 3/4" on 14ct. Scatter Seeds Of Kindness Throw Blocks 7 through 9 stitch count for each block 95w x 95h, approximately 6 3/4" x 6 3/4" on 14ct. Noel stitch count 130w x 60h, approximately 9 1/4" x 4 1/4" on 14ct. Jingle Bell Parade stitch count 178w x 111h, approximately 12 3/4" x 8" on 14ct.